Marrickville Council’s bike budget will be more than $1 million this financial year (2015-6), following a strong boost in Council’s internal budget and several successful grant applications. Campaigning by the Greens and bike groups last year led to a doubling of Marrickville Council’s internal bike budget. The further increases this year meets the broader campaign target set by the Greens, and indicates the growing recognition within Council that building bike paths are “core business” for Council. Questions on Notice by the Greens (linked and extracted below) reveal the details of the proposed spending, which was debated and passed with the support of the Greens Councillors, Labor Councillors and the Mayor as part of the 2015-6 Marrickville Council Budget at Council’s June meeting. Liberal Councillor Tyler and Independent Councillor Macri voted against the budget in its entirety. Greens Councillor Sylvie Ellsmore, who is the Chair of the Marrickville Transport Committee and a regular cyclist, said: “The bike spending of $1.2 million in a single year is a very significant increase. It comes off the back of years of campaigning by local residents, bike groups and the Greens. “Local residents put a high value on building new, safe bike paths, as the inner west has one of the largest and fastest growing group of cyclists. Importantly, the Marrickville Local Government Area also now has the largest percentage of women cyclists of any Local Council area in NSW, at 26%[i],” Clr Ellsmore said. Clr Ellsmore said, “Over the last few years Council has made significant new investment in its roads and footpaths. The Greens have been arguing for a long time that bike paths, just like footpaths, are key infrastructure and deserve proper investment. “The Greens ran a campaign in the lead-up to last year’s budget vote calling for a significant increase for bike path. At the time, research released by the Greens showed that only 9% of the priority bike paths in Council’s Marrickville Bike Strategy 2007-2016 had been completed. “As a result of the flood of submissions we received from commuters, families and recreational cyclists calling for greater investment in bike paths, Council voted to increase the amount of money it was committing from own coffers to last year’s bike budget by $200,000. Council also agreed to better integrate bike path planning with Council’s general road and footpath upgrade programs. “The proposed 2015-6 bike path budget doubles the bike budget again, and makes good on Council’s promise to make building better bike paths part of our core business. Building better bike paths is an important part of making our local areas safer, healthier and more liveable,” said Clr Ellsmore. 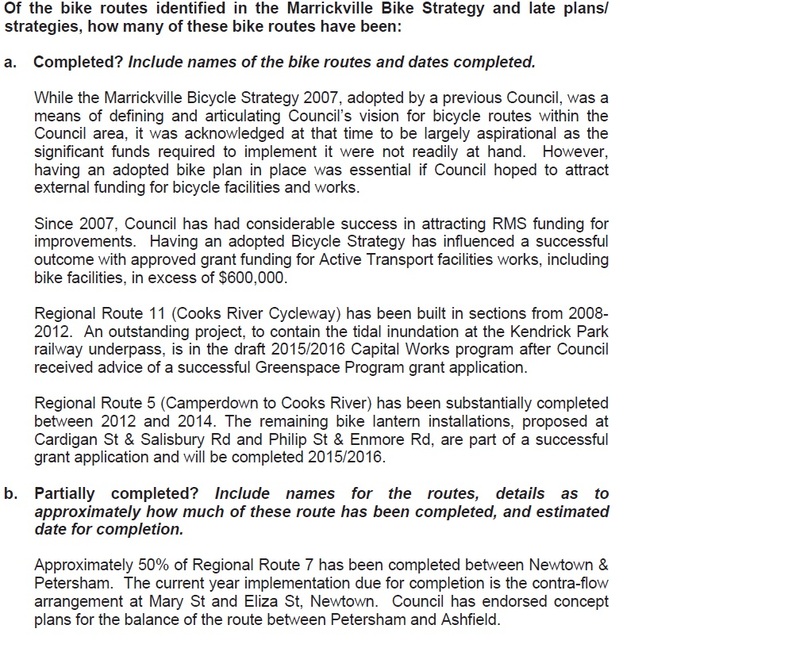 The proposed new spending includes planning for several regional bike routes paths, as well as completion of a number of existing bike projects, as detailed in the Answers to the Questions on Notice tabled at the 19 May 2015 Council meeting (attached). A further late $200,000 grant was received, on top of the spending outlined in the 19 May 2015 Questions on Notice. [i] See details in the Super Tuesday Bike Commuter Count 2015, available to download from https://www.bicyclenetwork.com.au/media/vanilla_content/files/Bike%20Futures/Counts/SuperTuesday/2015/ST2015%20Report_NSW_Summary.pdf . Marrickville Council participated in the count for the first time in 2015, following a Greens Notice of Motion. The count includes a sample of a number of sites. Sites will be expanded in future years. A full copy of the answers to the Questions on Notice can be downloaded here – 150519 Mville Council QoN Bike Path Funding. *Note – These figures combine internal and external grant funding. 2013/4 included some significant grants from the State Govt. For 2015/6 a further grant was received after May 2015. The 2015/6 figure includes $500,000 allocation by Council directly – the largest ever provided – with the additional income from government grants following a significant increase in the number of grant applications made by Council for bike projects. The State Govt grants for 2015/6 are a mix of planning and implementation – noting an additional grant was received post May 2015.